Face Value: I find this cover incredibly appealing. I like the use of color, the aesthetic of the graphics fits the story quite well and we see Oona in action outside the Dark Street house. It also does a nice job, aesthetically speaking, of demonstrating that this book was set in the past but published in 2011. 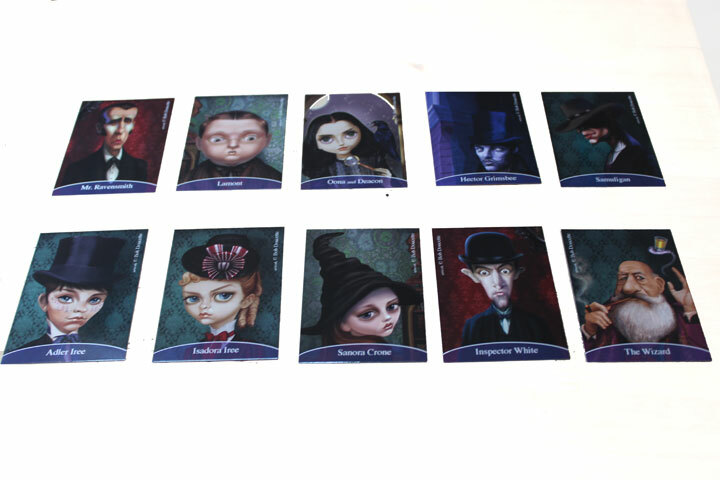 If you need more convincing, take a look at this gorgeous set of character cards that I found on Odyssey’s Goodreads page, and just try convincing me you don’t want to know more about these characters. Does it Break the Slate? Yes definitely, but could go further. Oona Crate is a quintessential Slatebreaking heroine. I stuck this book near the top of my to-read list as soon as Forever Young Adult described her as “Veronica Mars mixed with Hermione Granger, with a dash of Plain Kate.” And this glowing recommendation is spot on! Oona is talented, loyal and brave and a little bit reckless. She’s smart enough to figure out who’s trying to hurt her uncle and bold enough to take major risks in pursuit of justice, and she solves the mystery and saves the town on her own, without any help from the insipid Inspector White. If it were only Oona I was talking about, obviously, we’d be dealing with a shattered slate here. However, this book falls victim to a relatively common occurrence in popular culture, something I like to call Extraordinary Girl Syndrome. Basically what happens is that you have a female protagonist who is smart and tough and generally recognized for awesomeness. BUT, that female character is constantly being referred to as the exception to the rule, grudgingly respected for being Not Like Other Girls. Usually, in a case of Extraordinary Girl Syndrome, all the other female characters are represented as frivolous, helpless uninteresting creatures, shown in stark contrast to Our Heroine. So in this story, while Oona is undeniably fantastic, all of the other girls we meet are shallow and appearance obsessed. The downfall of the whole town, in fact, is nearly brought about because of certain female characters’ desire to look a certain way. All of Oona’s obvious allies, throughout the story, are male. HOWEVER – I am holding out hope that as we hear more of Oona’s story, we start to see a little more character development from some of the other women we were introduced to in this story. Isadora gave me a little hope at the end, so maybe we’ll start to see her come into her own more in future books. I hope so. A character as fantastic as Oona Crate is deserving of equally complex and interesting companions. Who would we give it to? Oh, this one is going to have widespread appeal. I’d start with 9-12 year olds who keep reading Harry Potter over again. But there’s more than just magic here! If anything, I’d say the scale is tipped slightly more towards detective story, and I’d put this in the hands of anyone who’s been reading Nancy Drew or The Boxcar Children. And because it centers around an orphan in a magical version of New York City during the Gilded Age, I’m going to have to point out that my ten year old self would also have been directly in the market for this particular story. Review: Oona Crate is a Natural Magician – an incredibly rare ability that makes her the perfect candidate to be trained as apprentice to the Wizard of Dark Street (who happens to be her uncle). Most practitioners of magic in Oona’s small community (hidden within New York City in the 1870s) are Learned Magicians, but Oona has a natural born ability. But Oona has no interest in magic – since the magic-related deaths of her mother and sister she has rejected it completely, choosing instead to follow in her father’s footsteps and become a detective. When her uncle disappears, Oona’s detective skills are needed, but she finds she may not be able to completely leave magic behind. As I mentioned above, Oona is a terrifically likable MC. She is a girl of action, which I admire, but she’s also incredibly smart and thoughtful, and determined. She believes in logic and practical answers and doesn’t trust the ephemeral quality of magical doings. “Magic is a fickle thing” she tells us in the first line of the book. “I prefer things that work.” Aware firsthand of the danger that comes with the something as unknowable as magic, she puts her faith in practicality and her own brain. Watching her use her deductive powers to solve the book’s core mystery is a total delight. One of the things I really appreciated was the way this book doesn’t shy away from difficult subjects, and honors the complexity of Oona’s feelings surrounding them. Oona’s mother and sister died, and it was because of a magical accident that Oona indirectly caused. It’s no wonder the girl doesn’t want anything to do with magic, and the depth of her feelings is given sincere weight. Oona trusts the power of her own logic, but she doesn’t trust this unknowable, magical part of herself. And what more, really, can Oona, or readers ask for? 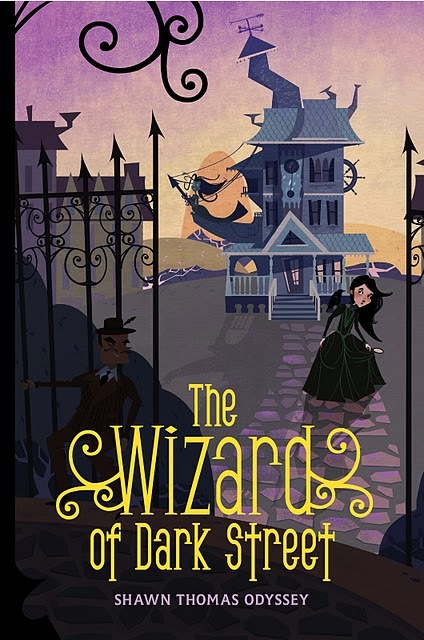 The fact that the Wizard is respectful of her choices allows this story to be truly about Oona’s decision, about determining her own destiny and identity based upon her own wants and needs. Though as of now, this is a stand-alone novel, I definitely feel Odyssey left the door open for future adventures. I look forward to seeing more of Ms. Oona Crate. This entry was posted in Middle Grade, Reviews and tagged Girl Detectives, Historical Fiction, Magic, Middle Grade, Mystery, Orphans. Bookmark the permalink. This sounds likw it is right up my alley! On my to “To Reads” it goes! I am reading it right now and it is the perfect blend of fantastical and mysterious. Loving it!